I don’t know that any one essay or any one interview will help in an immediate and concrete way…but I do know the power of stories: how they get us to expand our imaginations, how they encourage us to think differently about our lives. The hope is that Work Stew will provide, both on the page and in the podcast, a good mix of stories—food for thought as we each find our own way. Since then, I’m struck by the fact that each essay and interview has actually helped me, many in very specific ways. Mark Spearman’s moving piece on the satisfaction he’s found in being able to support his children’s dreams. Tasha Huebner’s powerful reminder that having work of any kind is nothing to sneeze at. Gerald Casale’s raw acknowledgement that even rock stars make compromises. Lindsay Moran’s eloquent thank you to the men and woman of the CIA, an employer that has long inspired in her deeply mixed emotions. Each of these essays has helped me to look at the work I do in a new way. Perhaps there’s a way to make peace with it, I’ve started to think. On the other hand, I’m struck that Lindsay, for example, did choose to leave the CIA, and that the need to make a change emerges as a Work Stew theme just as often, if not more frequently, as the themes of reframing and acceptance. For example, I’ve found myself inspired by Samantha Cole, who traded in her office job to become a journey-level carpenter; by Jane Viau, who left a VP role at Merrill Lynch to become a high-school math teacher; and by Hollywood producer Malvolio, who made less dramatic but equally important changes to put himself on a more satisfying career path. So, as far as my own ‘work stew’ goes, it continues to simmer; I’m still sorting through some thorny issues, and I haven’t figured out anything “for once and for all.” What I can say, though, is that this six months has been the most pleasant and productive period of stewing I’ve ever had—and that’s saying something, because I’ve stewed for decades. Literally decades. So, thanks to all of you who have contributed to Work Stew—as essay writers, podcast guests, readers, and listeners. Taking this journey with such a merry band beats, by leaps and bounds, what I was doing before, which was stewing solo. It’ll be interesting to see what the next six months brings, and I hope you’ll stick around for the ride. P.S. 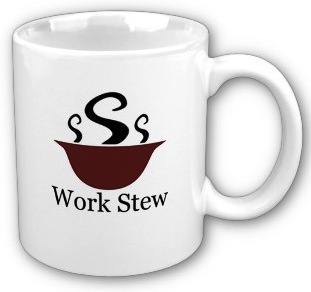 Thanks also to everyone who has purchased a Work Stew coffee mug. Work Stew’s bandwidth costs are now almost wholly reader/listener-supported, getting me closer and closer to my goal of making this a self-sustaining project. If you’d like a mug or are interested in supporting Work Stew in some other way, please contact me at kate@workstew.com. I have enjoyed every post at Work Stew ( so rich with lessons I may have personally been thru in the past, or am learning afresh..). I keep coming back for more here, as Work Stew stabilizes my own thot process vis a vis my current journey in life. Its adds to my introspection, my rationale, gives far deeper meaning to the ‘struggles’ one goes through in the mind. Struggles which are not necessarily ever articulated even to one’s own self at times.